You would think that I might have all sorts of time to dive back into food photography now that I have been laid off but its not been the case. I have been doing something MUCH more important – reconnecting with the family who I had to spend a lot of very stressful time away from this past year (really took a toll on us all). I am trying to ease back into the wonderful world of food photography by doing some shots for Lou Manna’s contest (see above for details) – while also job hunting, an activity that takes precedence over any projects. I am not certain that this batch of photos really hits on what is needed to win this contest of Lou’s. There isnt a whole lot of obvious styling – its much more subtle – its about the shape of the plate curves and the chunks of papaya. 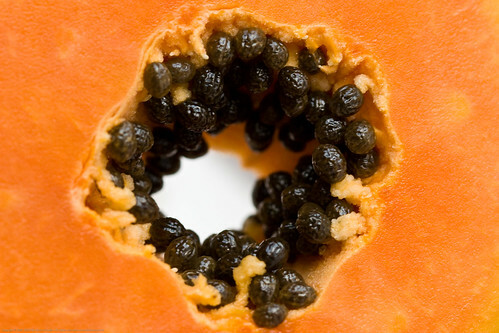 I consider this a study of the very odd looking papaya and, at base, I hope you learn something about this fruit and also are not repulsed by the odd black seeds and how they cling to the interior. Some of these are more and others are less suitable for possible contest submissions. I would love to hear from you if you think any of these have an ineffable quality that you find arresting. Its ok if you dont find that in any, would like to hear about that too. This one plays with depth of field on a more obvious level. I will be doing more studies before the contest deadline, I am not sure that this set represents the level of skill and styling that is competitive enough. 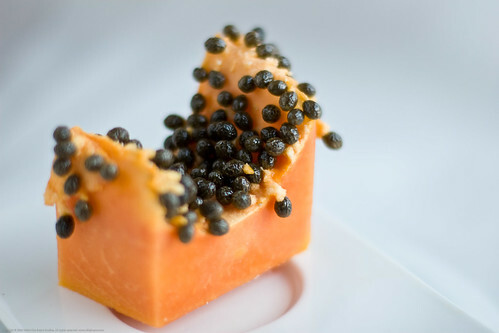 Beautiful study of the papaya. I really like the first one since I haven’t seen angles like that on a papaya, which makes it unique. 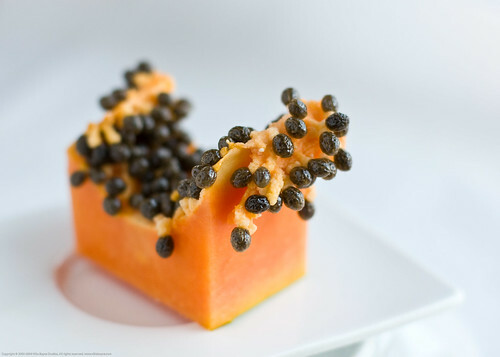 S: kewl, thnx for the input.. Thats my fav too – had envisioned that shot before I got the papaya so I am a bit biased! 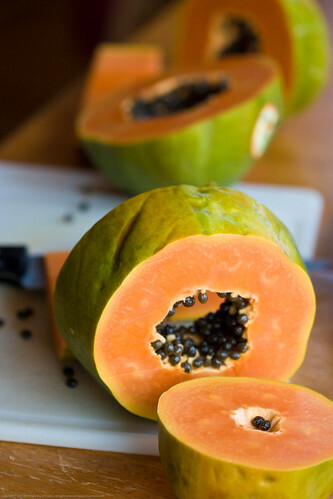 I liked the first one best as well, as I thought that was an unusual perspective, even though papaya is a frequent visitor at our table. I like the first and the second one. You are inspiring me to replace my camera.